Few people living in Beijing have a reason to explore past the Fourth Ring Road, where newly-built high-rises replace old low-rise blocks in a flurry that seems like endless construction work and an undermining of the character those areas used to possess. Fortunately, there are still some interesting things to be found hiding between the towers. One such example is the Daliushu Ghost Market, located by the East Fourth Ring Road. Taking place every Wednesday morning, the first vendors are set up way before dawn, a tradition that has made it an early-hours pilgrimage for hawkers and gawkers over the past 40 years. Market goers carry headlamps with them. 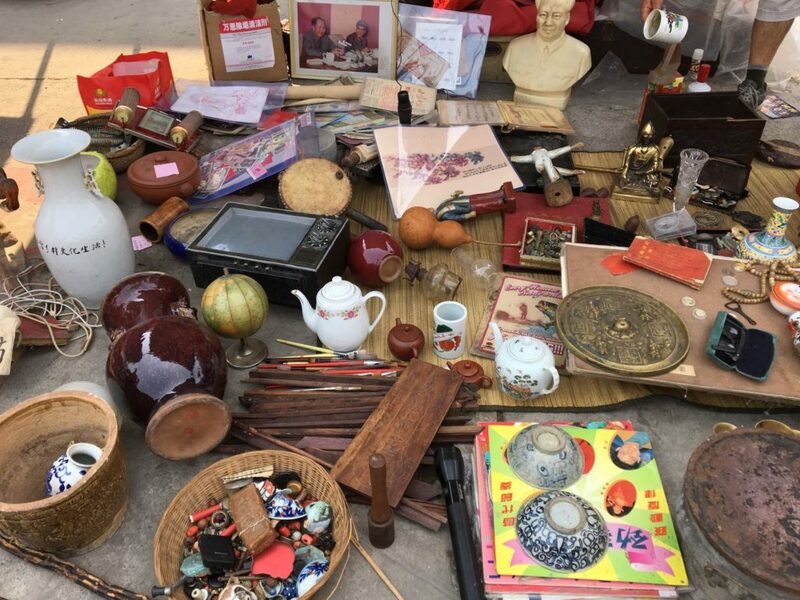 Less well-known than the more centrally-located Panjiayuan Antique Market, the prices at Daliushu are on average much lower thanks to its outlying location, the items are also so varied that you’re likely to walk away with much more than you bargained for. You’ll find anything from jade jewelry, emerald bracelets, amber beads, porcelain tableware, cassette tapes, old books, vintage sunglasses, clothes, shoes, musical instruments, traditional paintings, decorations, vintage cameras, posters, calligraphy, electronic accessories, furniture, perfume, and countless other knick-knacks neatly lining the floors. One explanation for what constitutes a ghost market dates from the decline of the Qing Dynasty (1644-1911) when wealthy families were watching their riches slip away from them but were too ashamed to admit it. They, therefore, chose to sell their belongings under the cover of the night instead. Those families even included royalty, so it was possible for lucky treasure hunters to stumble across items that were hawked at bargain prices but turned out to be worth a fortune. It’s also said that the name may have arisen from the fact that some of the items sold at the market were stolen from royal palaces as if robbed by ghosts, or even that they had been bought from tomb raiders. Items for sale in the market. To this day, the market opens at 3am, adding a sense of mystery and adventure. Those afraid of the dark will be happy to hear that it officially shuts 12 hours later, at 3pm. Despite its early opening time, the hustle and bustle starts at around 8pm the day prior, partly because some of the vendors make long trips from surrounding provinces. 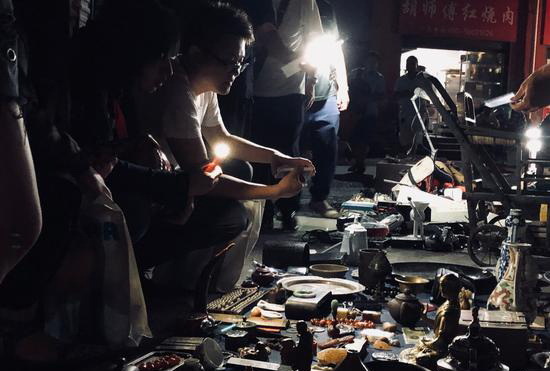 The most experienced buyers usually come during the hours of darkness – many wearing headlamps or carrying flashlights – in the hope of snapping up (purported) antiques, believing that the best deals are to be found early on. However, prices are more negotiable nearer to closing time with vendors eager to pack up and leave. 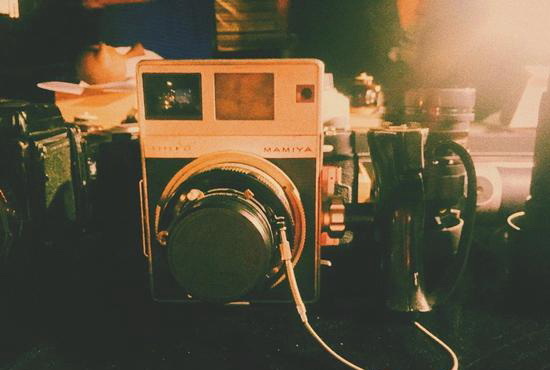 As well as veteran buyers who may otherwise be engaged in trading antiques professionally, the market also attracts groups of hip and young vintage enthusiasts. What draws them is not only the fair prices, but the fact that the market’s teeming with unique items not to be found elsewhere. That being said, there’s one unspoken rule at the market: don’t ask the vendors where they got the item from. Not only are you unlikely to get a straight answer if you do, this tradition hangover from the ghost market’s early days, when the affluent sellers would disguise their identities and refuse to talk, wearing concealing clothing miming prices instead. 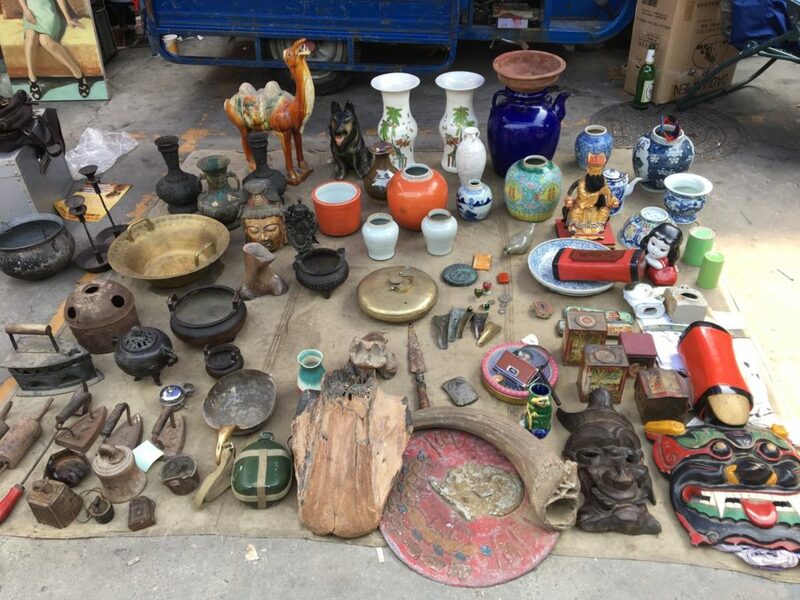 From the articles we saw, we can assume that many of the artifacts came from other antique markets around the country, from being collected from rural families, or as in the past, are old family heirlooms being sold off. In that regards, they can give you a glimpse of peoples’ lives back in the 1950s or ’60s. Sadly, like many other historic Beijing institutions which have disappeared overnight, the Ghost Market is threatened with potential closure. Faced with a similar fate to the Baoguo Temple Market in Xicheng District, which was shut down by the authorities in 2011 after 14 years of operation, at best Daliushu may soon undergo renovation. Sadly that may take much of its rugged charm away. A vendor from Shanxi told us that the market is affiliated to the neighboring shops and are leased out by one entrepreneur. The lease for the space is due for renewal this October, and if the government and the entrepreneur fail to reach a new agreement, the market will be forced to close. For that reason alone, we’d recommend putting time aside to visit one of the capital’s last remaining ghostly gems before it slips into the darkness of time. How to get there: Take Subway Line 7 to Nanlou Zizhuang and get off at Exit C, then turn east and walk straight around 200 meters. Be Forever Young This June 2018: Celebrate Children’s Day, Enjoy Summer Parties, and More!